We won't sell or give your information to anyone, ever. When you place an order with us you provide us with your name, address, phone number, and email address. This information is used to communicate with you and dispatch your order. We won't solicit you with email or any other communication except regarding your order unless you subscribe to our newsletter. 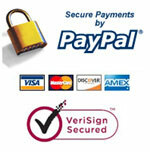 Your credit card information goes directly to Paypal's Verisign-secured server. We do not (and cannot) receive or view any of your credit card or financial information.